In order to receive loyalty rewards at Santa Ana River Lakes, anglers must register through Belly rewards program. This can be done FREE at the baitshop. Anglers will only be able to check in at the baitshop 1 time every 12 hours (day & night fishing) 5 points per check in. Anglers will only receive BIG FISH extra points for taking a photo at the baitshop with the BIG fish. Anglers must have a Belly rewards card registered and ALLOW his or her E-mail address to be shared with Santa Ana River Lakes. Angler must also give his or her e-mail address to staff at the time of checking in the fish. The person or persons in the photos must be the anglers who caught the fish. BIG FISH FOR BIG POINTS: You must take a photo with your BIG FISH at the baitshop and your E-mail address must be given to staff checking in the BIG FISH. 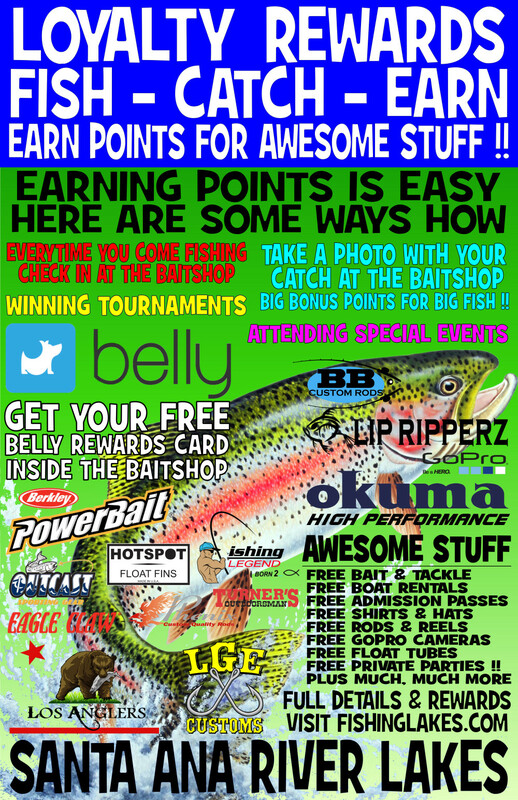 Points will be rewarded for fish starting at 10 pounds and up. You can only recieve a maximum of 200 points for a 20+ pound fish. Example you check in and take a photo with a 10 pound trout you will be awarded 55 points. BIG FISH must be a trout, catfish or sturgeon to qualify for points. Catfish or Sturgeon 20 pounds and over must be caught & released per lake rules. Points for special events & tournaments will be announced just prior to the event.